Mr Palmieri would speak of his brother and his wife in the present tense. But on this record he does not need to. This music speaks for him. It is vivid and because it is played by members of his brilliant core quartet – Luques Curtis on bass, Camilo Molina on timbales, drums and batá, “Little” Johnny Rivero on congas – together with a constellation of musical stars glitter in the Latin Jazz firmament; from trumpeter Brian Lynch to trombonists Jimmy Bosch, Chris Washburne, Doug Beavers and Conrad Herwig, saxophonists Yosvany Terry, Ivan Renta, Craig Handy, Gary Smulyan and the incomparable Ronnie Cuber. The majesty of the music comes also from breathtaking arrangements by old friends Ray Santos and José Madera, “supervised” by Mr Palmieri himself which must surely bring back memories of the halcyon days of Puerto Rico and El Barrio, where the three of them forged a sound as unique as the greatest Latin-Jazz bands of all time. 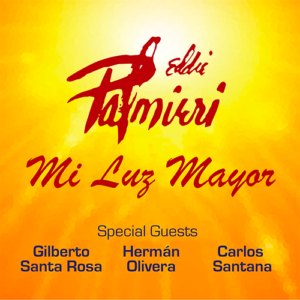 Mi Luz Mayor is a “spirit record” brimful of “heart music” which is why the memory of this music, so closely linked to the love affair Mr Palmieri shared with his wife, while nostalgic is far from sentimental. Rather it is a means of joyous communion between Miss Iraida and Mr Palmieri, together with a lifetime of music (Mr Palmieri is now in his ninth decade) invoked the name and spirit of God and the musical elders who inhabit the spirit realm of all music and art. To make the connection down here on earth Mr Palmieri has invited two inimitable vocalists – Gilberto Santa Rosa and Hermán Olivera – to placate the spirits with song. Even Carlos Santana – known for his own deference to spirituality – also appears to provide a magical electric guitar performance on “Mi Congo”. This is a special treat as the electric guitar is something relatively rare in Latin Jazz, where guitar parts are more often glorified by the tres. Nelson González is given that honour briefly as he performs “Abarriba Cumbiaremos” which was made famous by Charlie Palmieri, who played René Hernández’s iconic arrangement, to which Ray Santos has embellished with saxophones and trombones. As with that song so also with much of this repertoire such as the memorable material and the bolero “Que Falta Tu Me Haces” and “Soñando con Puerto Rico” by the indomitable Bobby Capó, so also with “Tremendo Cumbán” by Orlando Peña, a classic made famous by Machito and much of the other repertoire on this magnificent recording. But the crowning glory belongs to the poignantly beautiful “Mi Luz Mayor”, dedicated to Miss Iraida, in whose honour all of this memorable music is played by the peerless Eddie Palmieri.